To add a fund raising event held by the committee, follow the steps as shown below. Note: Does not apply in the Political Party module. Select the Fund Raiser icon on the toolbar or Edit and then New Fund Raiser. Enter the date, and the number of attendees. 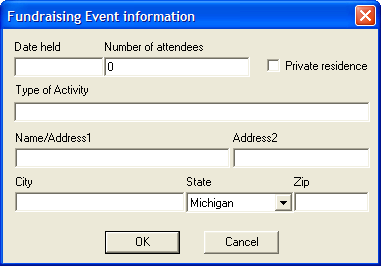 Enter the name of the event in the Name/Address 1 for display in the drop down list. Enter the address of the event in the Address 2 field. Select Ok to save the entry and close out of the fund raiser information window. Select Cancel to close out of the fund raiser information window without saving new entry. To Modify an existing fund raising event right click on the event located in the ‘All Transactions’ tab and choose modify as shown below. 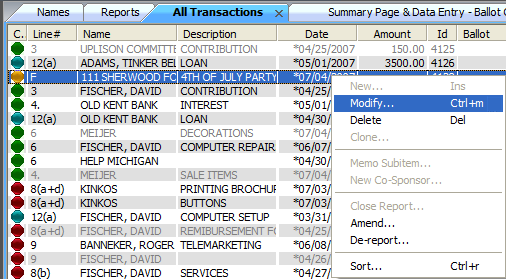 To Delete an existing fund raising event right click on the event located in the ‘All Transactions’ tab and choose delete. Please note if the name is associated with any transactions the system will not allow this record to be deleted.